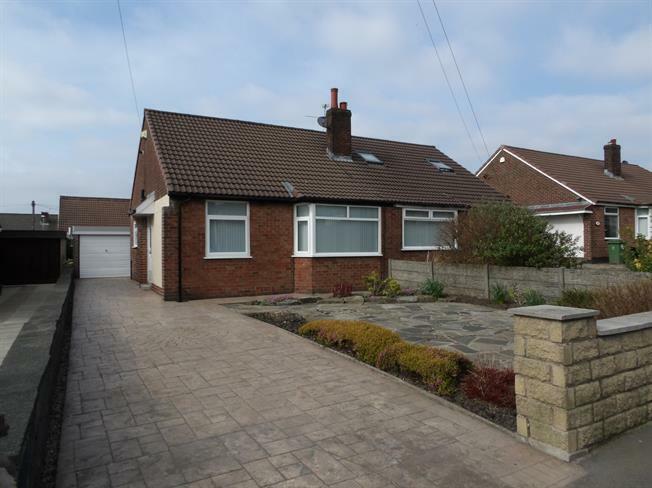 2 Bedroom Semi Detached Bungalow For Sale in Bolton for Offers in the region of £175,000. Recently modernised throughout and offered for sale with no onward chain is this fantastic semi detached bungalow situated on Hunger Hill in Bolton. In brief the accommodation comprises an entrance hallway, lounge, two good sized bedrooms, modern bathroom and kitchen. Externally there are well presented and low maintenance gardens to the front and the rear with a concrete imprinted driveway leading to the garage. Double glazed uPVC window facing the front. Radiator, carpeted flooring, original coving, wall lights and ceiling light. Double glazed uPVC window with obscure glass facing the side. Radiator, vinyl flooring, tiled splashbacks, ceiling light. Low level WC, panelled bath with mixer tap, vanity unit and inset sink with mixer tap. Double aspect double glazed uPVC windows facing the rear and side. Radiator, vinyl flooring, tiled splashbacks, ceiling light. Fitted wall and base units, stainless steel sink with mixer tap and drainer, freestanding gas oven, space for a washing machine. Double glazed windows with door to the rear.